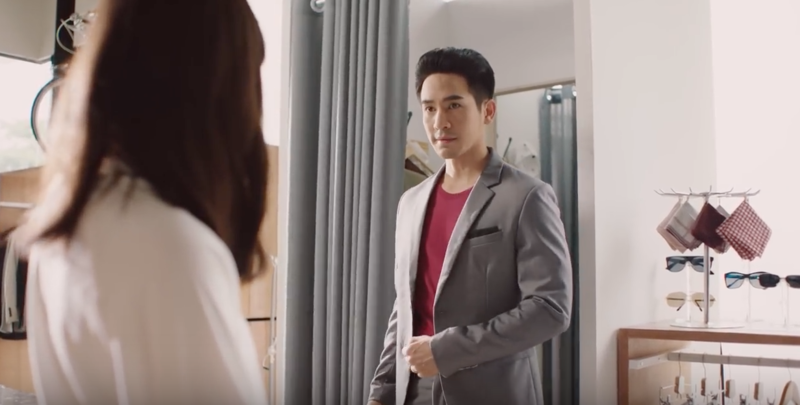 Thailand is still feeling the effects of Buppae Sanniwas fever, so several commercials featuring the cast continue to materialize. 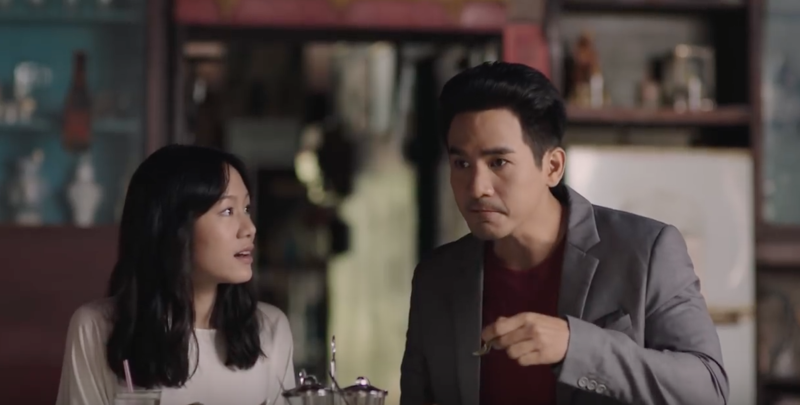 Case in point, the latest commercial for TrueTaoGae (TruePointandPay) 4.0 app tailored for shop vendors, featuring Pope Thanawat. I’m covering the recap for this commercial because it just so happens to tease us with the premise of Phor Daed time traveling to the present. Dreams do come true, if only for five minutes. In a dark bedroom, a woman pulls a late night. She receives a birthday message with a chant passage written three times: “rak ka, banja, weewanansa.” She chants it slowly into the night, wondering why it was written for her, when suddenly, like a spell, a man appears before her. He’s holding a bowl of noodles and dressed in boran (olden day) clothing. She freaks out and throws a book at him. “Stay back!” she shouts and grabs a racket. The man is also shock to see himself no longer at his table, “Who are you? How did I get here?” he looks around, still holding the bowl of noodles and chopsticks as if he was about to eat it. Lol. She pauses in thought and extends her free hand to her keyboard, googling his name. His picture and history populated and to her shock she mutters, “He time traveled..” As she reads further, the article says that a time portal will only appear if he re-enacts the same scene of his destination. He must be at a similar place and doing the same thing. Next thing we know, it’s daytime. She’s leading him to a cab where she asks to be taken to Ayutthaya. However his state of dress code raises eyebrows so they opted to do a modern makeover first. Commence funny outfit changes! He tries on several outfits until a suit strikes us all speechless. The woman peers at him, unblinking. He was handsome in his old getup, but in this modern suit, he is divine. Hold on, I need a moment. She stares at him dumbfounded. The woman croaks, “Let’s settle the bill.” Lol. Finally, they arrive at a noodle shop. They are the only ones there but the woman notes that this should be exactly like the noodles he had in Ayutthaya. He sips and confirms, but the time portal does not open up. Phor Daed reasons that where he come from, the noodle shop is much livelier than this. Hahaha. She approaches the shop owner and relents that they need to increase her business. So she pulls out her #truepointandpay app and starts advertising on social media about the shop. Next thing we know, and with the use of this app, the business bloomed and the shop is peaked with patrons. That seems to trigger the chant she had read that night. She pulls out her phone and chants the passage again, the space time continuum portal opens. Phor Daed quickly asks for her name but before she could answer, he is gone. The woman mutters her name, “Nok..” which means bird, and we hear a bird chirping in the background. Lol. Depressed, she stares at the table as another patron approaches and asks if the spot is taken. When she looks up, it’s the modern day Pope.